One of the biggest problems with instant messaging is that not everyone uses the same network. Typically you'll have friends who swear by Windows Live on the one hand, while others refuse to budge from Yahoo Messenger on the other. Throw in the growing popularity of alternative mediums like Facebook and Twitter, and keeping track of your online buddies' movements can be tricky. 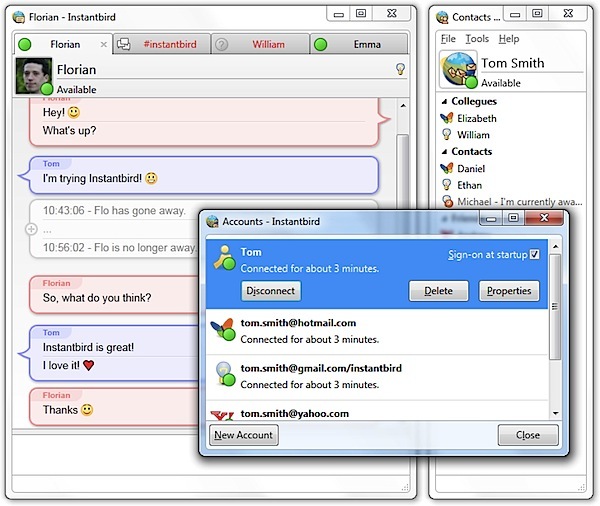 Instantbird 1.0 aims to bring together many of these disparate networks and services under one roof, and while not as polished as more established multi-network clients like Trillian and Pidgin, its close links to Mozilla makes us confident the program will evolve into a powerful alternative to these programs in time. Instantbird aims to be a Swiss army knife for instant messaging, covering each of the major networks and the top social media ones too. You'll need existing accounts for each network that you connect to, but Instantbird enables you to use the same program to chat to all your contacts no matter where they decide to reside. Once the program's installed you need to set up each of your accounts. Choose Tools > Accounts > New Account. Click "Next" and then select the network that you want to add to Instantbird. Enter your user name and password plus any other configuration information you're asked for. Complete the Wizard and repeat these steps for each network you want to include. Back in the main Window, you'll see each of your online contacts on each network. Double click one to open a chat window. You can set your status in each network by choosing File > Set status to and then choose Available/Unavailable or Offline. When adding a new contact choose File > Add Buddy. Enter the username and select which network you want to find this buddy under. Select the group you'd like to place this person in and click OK.
Instantbird 1.0 is open source, and available now as a free download for Windows, Mac and Linux.